While researching the NiteCore SmartPD EX10 R2 I was also looking for a 2nd flashlight that took AA batteries. The AA battery form factor is bulkier than the CR123 batteries that the NiteCore uses but the advantage is that AA batteries are far cheaper and easier to find. The low cost and easy availability of AA batteries makes a AA light an excellent companion for traveling. After some research I found a light I felt was perfect, the Fenix LD10, and decided to purchase it from Outfitter Country on Amazon.com. 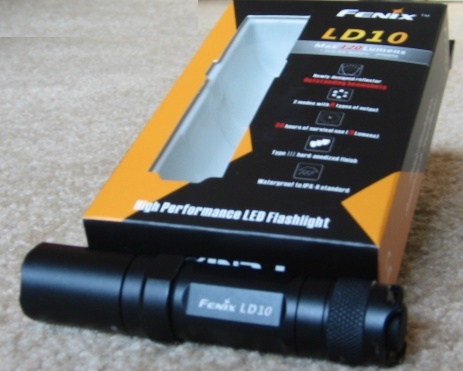 The Fenix LD10 is a follow-on to the popular Fenix L1D, the LD10 features a redesigned exterior and improved reflector. I don’t have a L1D so I cannot compare the change in the reflector. However, looking at pictures of the L1D I can see that the exterior has been updated to put a multi-sided surface around the head of the flashlight. The surface makes the flashlight easier to hold and it prevents the light from rolling around when you put it down on a flat surface. The LD10 still uses the Cree Q5 LED that the L1D used and doesn’t come with the R2 version used in the NiteCore EX10. I can see a definite but not significant difference in brightness between my NiteCore EX10 and the LD10. A really cool feature of the Fenix L series is that the heads and bodies are swappable with other L series lights and most of the P series lights. So, I can use the head of my LD10 with the body of a 2xCR123 Fenix P3D or PD30. This will give me longer runtime and up to 220 lumens out of my LD10 head because the CR123 battery can source more current than a single AA. So I can pack different bodies and carry what I need based on my plans. Access to 6 light levels – min, med, max, turbo, S.O.S, and strobe. The strobe mode only works at the turbo light level. This video shows off the different modes available on the Fenix LD and L1D series of lights. I’ve have the LD10 for for a few weeks now, almost as long as I’ve had my NiteCore EX10, and I’m happy with it. Just like the EX10, the LD10 is solid, well built, and gives me loads of light on a single battery. However, unlike the EX10, the LD10’s controls are easier to use and are much more reliable. I always know where the light is going to start and I can easily switch between modes by soft-clicking the tailcap switch. The fact that AA batteries don’t store as much power as CR123 batteries is readily apparent in this light. I can get barely 20 minutes of light out at turbo mode before turbo mode is dims down to be just as bright as the high light mode. The battery type doesn’t seem to matter, I’ve seen the same result using both lithum and eneloop brand rechargable batteries. I don’t think we’ll see an improvements in the duration of light output until large gains are made in LED efficiency. The low mode is great for getting around the house and the high/turbo mode is good for night walks and general outdoor night tasks. In addition, The strobe mode is great for biking or walking at night – it really grabs attention which ensures drivers will notice you. For hands free operation, Fenix sells both a bike mount and headband that you can use to attach the light to your bike or body. Strobe mode is also great for alerting other drivers when you have to pull off the road in your car – the anti-roll design means that you can just turn the light on and put it on your car trunk or roof to alert fellow drivers. I really like the fact that Fenix offers a variety of acceseories to modify their lights to fit your needs. Besides the interchangable bodies, headband, and bike mount I mentioned earlier; Fenix also has diffuser tips for general lighting, filters for night vision, and a pressure switch for remote activation. It would be nice if they had a magnetic mount I could use to attach the light to my car or other metallic surfaces for when I need both hands free and don’t have a flat surface for the light. While a little bulky to use as a everyday carry light, the Fenix LD10 is great for travel and general use around the house and outdoors. The AA form factor makes it cheap to operate but it also means that the maximum light output is unsustainable for long. I really like the strobe mode and available acesseories – I plan on at least getting the bike mount or headband for night biking during the winter. Variety of accessories – headband, bike mount, bodies, and diffusers. Uses easily available AA batteries. Amazing light output for a 1xAA battery light. Very short lived turbo mode.